Metal: I think its Zinc! Quantity: So far just one! Cost: about .28 + shp. All the hard work has finally paid off! I have been workin on this design for about 2 minutes and it it finally done! I designed it, minted it, and will be selling it through Cry Wolf coins. i will also be accepting trades! This is just a presale, only one is available now...The others will take a few minutes to get back from the mint! This coin also makes a great 5/8 washer- I decided I wanted a coin that was dual purpose, so after the long nights and countless days designing, creating and changing the coin- HERE IT IS!- enjoy! Please go easy- Shes my baby! I'll take two in each metal! I sure wish there was a smilie with a "Loser" symbol on the forehead..........lol. Will there be a limited edition in brass? I love the cutout...it seems the perfect placement. This could be the first of your tool time series. maybe- I have to see the demand first! 2 per cacher only please- I dont want these on Ebay! Are you going to do a run in stainless steel? I'll take 2 if you do...I'll even pay more since they'll be worth it . How about a micro in a similar design? Again - Ill have to check with the mint!... So far Ive got Stainless steel, Brass requests- The mint is about 10 minutes away, and its the weekend, so there might be a line at the Hardware section! WOW i never thought it would have been so popular- The initial cost was for the first run- the 2nd run will be about .32 to make up for the fuel costs and my time and labor!- sorry! Yep I will be doing micros as well- The overall size will be 3/4" and can accomodate a 1/4" bolt. These will not be available for some time now- Ive just been so busy with these that I am gonna take a break from the designs for a while. I want one of the ones that's got the 3-D front and back, but I hear that Groundspeak says geocoins can only be 3-D on one side. Dave you are easily one of the most entertaining geocachers I have met. I love ya man! Is the LE in red marker or blue marker? You could sell them to NASA for roughly $1,000,000 per coin plus shipping. Yep 3-D on both sides- see! Can you give me a link? Ill give you the leftovers after the .32 is covered! Will you post it in your cool Sig items page youve got goin on? Ive expanded my sells!!!! !- You can go to Home Depot and get them there! I just got off the phone with the corporate owner and they have stocked the shelves- all stores will have at least 150 in inventory by the end of today! 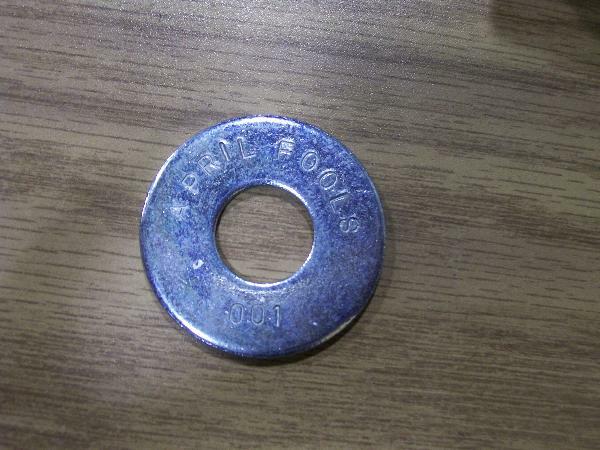 They expect them to sell out as the demand for 5/8 washers went up with the latest "coin craze" that hardware stores across the US has just been hit with!- GO GET EM! what is the shipping on the UK for these please. That would make or break the deal :-) Shouldn't there be an ' somewhere ?? I want one in gold sharpie!!! And brass. Cry wolf coins will be minting the available metals by Mon. or Tues. for anyone that may actually want one of these silly things, You may also get on the "Hope for a Stainless" Band wagon and if I hear of any available stainless steel- it will be included! Disclaimer: These NON Geocoins are NOT to be reproduced- after the 2nd run, the Dies will be retired so supply will be limited! 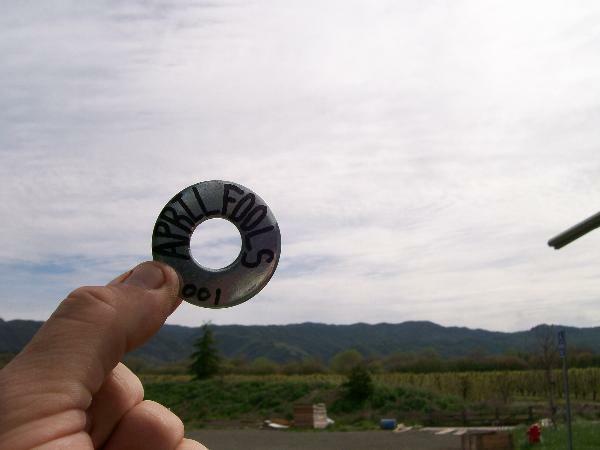 Hope yall had a great April fools! - But if you want a real geocoin made you gotta go to an actual maker and have one designed then minted- many factors are involved with the cost- Try www.geocoin-info.net (or google "geocoin") there is a list of retailers that can help you with a coin. Also there are less expensive routes such as pathtags and the new Geotags (that are trackable on GC.com) see the topic in this forum...there pretty cool! 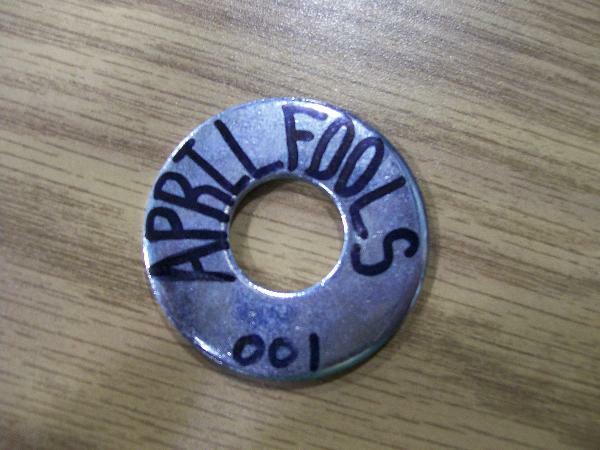 And if anyone really does actually want one of these silly little April fools "coins" PM me with an addy- I wouldnt want you to imbarass yourself by posting that you actually want one here! At least stamp them like your penny! I am having an auction on Ebay for the wood/metal worker foundation. Would you be interested in donating coin 001 for said auction. 100% of the sales will go towards the foundation. This is my XXLE- only one minted in the whole world....for now! It was created by special request! Oh those metal/wood workers would be proud! I could donate a set!....Even my XXLE! and start the reserve at like $100.00! Then they could have some funds to better supply the demand! Now thats what i'm talking about. i'll take 2. Hey - How come both coins have the same serial number? Are they all numbered 001? Did I miss out on the presales? Hey Dave, Will there be a metric edition for us in the rest of the world??? I figured the GSA could have 2 #196's...so he can do it, but I cant? Cause Im a Fraud! all my coins will be 001 to make everyone feel special! You can choose any of the 4 reasons I listed- whatever best fits the occasion in your book! Sorry mark- all presales were ordered yesterday! Fortunatley I only had one presale...and ill bet we all know who that was! ...Sorry- Maybe next year! As far as the #007 for your buddy-I will have to get with the mint and see what we can do, I think it will be fine. Dave at Cry Wolf coins has been an absolute pleasure to deal with on this coin! He is so easy to work with and the communication is EXCELLENT!....Let me ask............................He said fine! I like answer #1 (sold as a set) -- yeah that's it. Excellent idea for a coin. I missed the pre-order but sure hope I can get in on your 2008 version. P.S. please put me on the wait list if you have one. See next page for the cointest of a lifetime!! !